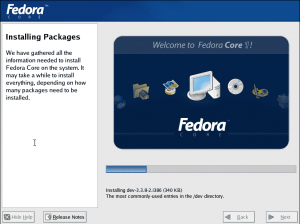 Feature: The first release of Fedora. Fedora Core 1, codenamed “Yarrow”, was the first version of Fedora and was released in 2003. Fedora distro was based on Red Hat Linux 9 and shipped with kernel 2.4.19, GNOME 2.4, and KDE 3.1.